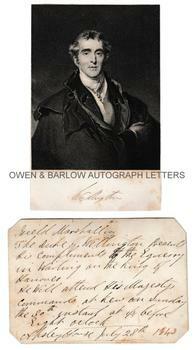 DUKE OF WELLINGTON Autograph letter. Arthur Wellesley, 1st Duke of Wellington. British soldier, victor of Waterloo and twice Prime Minister (1824 and 1828-30). AL on pasteboard card. 1p. Apsley House. 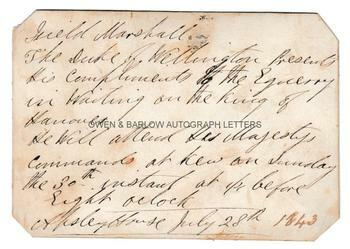 July 28th [the year 1843 added in another hand]. To the Equerry in Waiting on the King of Hanover. 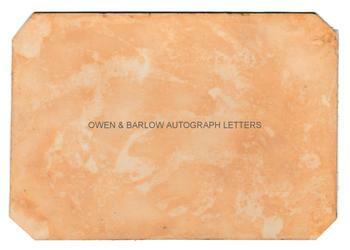 Sold together with a contemporary engraved portrait. "Field Marshall the Duke of Wellington presents his compliments to the Equerry in Waiting on the King of Hanover. He will attend his Majesty's commands at Kew on Sunday the 30th instant at ¼ before eight o'clock." Approx 5.5 x 4 inches (14 x 10 cms). Some browning and foxing and with mounting traces to verso. VG. Ernest Augustus I of Hanover (Duke of Cumberland) had endured an interesting and, at times, very strained relationship with the Duke of Wellington. Ernest had served in the War of the First Coalition, where his face was scarred by a sabre cut and his arm injured by a cannonball. He had wanted to join the British forces in the war against Napoleon but had been refused by his father, George III. Although he was Colonel of the 15th Light Dragoons, he threatened to join the Yeomanry as a private soldier if permission was refused to join the fighting. He was sent to the continent as an observer but, eventually he was sent out in command of 20,000 troops. During the Prime Ministership of the Duke of Wellington, Ernest disregarded the Duke's request that he should remain abroad and returned to England to lead the opposition to Wellington's Catholic Emancipation Bill. The Duke of Wellington complained to the King but was then obliged to resign as a direct result of Ernest's intervention. Ernest attempted to form a government himself but failed and the King recalled Wellington. The Duke of Wellington fervently hoped that Ernest would return abroad but, to his annoyance, Ernest remained in England and set up his household at Kew. His political influence ended on the death of George IV and the Duke of Wellington wrote that "the effect of the King's death will be to put an end to the Duke of Cumberland's political character and power in this country entirely". On the death of William IV there was some movement to pass over Victoria as heir and, instead, offer the throne to Ernest. This was strongly opposed by the Duke of Wellington. Provenance: From the 19th century album compiled by the family of Dr James Copland FRS (1791-1870), Scottish physician and medical writer.